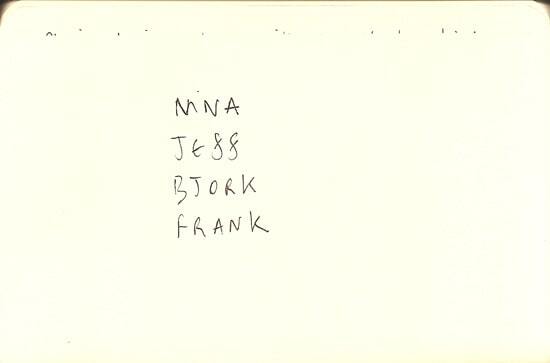 Nina Simone, Jeff Buckley, Bjork, Frank Sinatra. All these singers have beautiful nuances in their voices. Little request now: A while ago you could hear stems from the multi-track masters of famous recordings on the net. I’ve no idea how they came to be on the net. Maybe they were Pro Tools demos, or Guitar-hero tracks that the owners had let them use and then they inevitably surface on YouTube or wherever. Maybe if you know, fill me in on it. You could hear Queen, Marvin, Stevie, The Jacksons, etc. Remarkable learning resource for musicians. If you’ve no idea what I’m on about then google it for yourself and find out. Now, my request is this: Anyone know of a track where any of the four singers above is singing completely solo? Maybe a commercially available recording, or in the case of Bjork, maybe if she reads this she’d like to send me a solo stem of her singing :) I think to study what she does with her voice would be worth a thousand lessons, to me. She’s utterly remarkable. Same goes for the Jeff, Nina and Frank. Just unbelievable riches in their voices and a wash of soul and feeling to wrap your ears around.